In order for this blog to be an effective form of interactive communication for Longmeadow residents there is a need for people to contribute both new subjects and to make comments about existing subjects. To do either will require a "Google account". If you have already have a Google Gmail account, you probably have already signed up for a Google account. Gmail is just one of the services that having a Google account provides. You simply need an existing email account such as user@comcast.net and a couple of minutes to fill out the required form. There are no devious intentions with our Google account requirement. We will not be using any means to identify the real names of forum posters. Requiring a Google account to add comments provides some degree of authenication so that the forum cannot be easily sabotaged. This forum will allow anonymous postings of comments using the Google screen name that you select. In addition, all comments will be moderated... that is, screened for irrelevant or obnoxious content before they are posted. Requiring a Google account will also allow us to conduct polls without easy opportunities for sabatoge. For example, once you vote on a poll question, you cannot vote a second time. You can however change your vote. If you are interested in becoming a regular contributor of new subjects, send an email with your name/ address/ phone number to LongmeadowBuzz@comcast.net . Contributors of new subjects are not required to post with their real name but we do require that they provide their real name and address. LongmeadowBuzz is also interested in new subject ideas as well as suggestions as to how it can improve this forum. If you encounter any problems, send an email to: LongmeadowBuzz@comcast.net and we will try to provide some assistance. Go create a Google account and participate on LongmeadowBuzz. As we move in the general direction of Spring, and out of the shadows of Winter, it might be worthwhile to give some thought to the upcoming Town Elections. The Town Election is scheduled for 10 June 2008. There will be three seats on the School Committee that will be up for election. Geoffrey Weigand, an incumbent, is considering running for re-election. Jerold Duquette, an incumbent, is not going to run for re-election. Janine Idelson, an appointed incumbent, is not going to run for re-election. For the Select Board, Hal Haberman's seat will be up for election. Hal Haberman has not announced his intentions. Robert Barkett of the School Committee has taken out papers for the Select Board. Planning Board has a 5 year seat and a 2 year seat available. Housing Authority has one 5 year seat available. 50 signatures on a nomination paper are enough to get you access to the ballot. Papers can be picked up at the Town Clerk's office and they are due back by the 21st of March. In view of the fact that the budget for the schools is the largest part of the town budget, it would seem appropriate for a number of people to step forward to serve on this important committee. I think the principal qualification for a school committee member is that he or she be willing to stand up for the best interests of the students of the school system. They are, for the most part, not allowed to vote and the quality of the education that they receive is largely determined by adults. A school committee lives up to its obligations to the community by standing up for the best interests of the students. The Select Board is the designated agency for taking care of the general interests of the town. It would be pleasant to believe that these interests and obligations would not result in confrontation and contention between the two elected boards. However, the recent past indicates that this is not the case. There has been conflict, confrontation and contention. The November vote on the Proposition 2 1/2 override saw little support being furnished by the Select Board (William Scibelli was the exception.) and most of the "heavy lifting" for passage being furnished by the School Committee and concerned citizens of the Town. With at least two seats open on the School Committee and one seat available for election on the Select Board, voters of the Town of Longmeadow have an opportunity to significantly shape the future policy direction of the town. The first step in this process is the recruitment of candidates for public office. Hopefully, this brief essay will encourage citizens to consider moving from spectators to participants in our political processes. With all of the Select Board changes in water/ sewer rates for the 1st bill FY08 (July-Dec 2007) most of us are at least a little confused or unsure as to how much relief we will be receiving in the mail in the form of "abatement" or rebate checks. I have prepared a chart using the best available information to help individuals. Remember this is an unofficial calculation and not approved numbers from SelectBoard office or Longmeadow Finance Dept. As was highlighted in my last posting, water rebates are already approved while the proposed sewer rebates must be approved at the March 4 Special Town Meeting. The chart below assumes that the sewer rebate will be approved by the STM. The above chart shows that if you used 300 HCF for this last billing cycle and received a bill for $1173, you will receive an abatement check of $472 reducing your July-Dec 2007 water/sewer bill to $701 - a 40.2% reduction. Results from this analysis shows that low volume users (up to 100 HCF) will not receive a rebate check while high volume water users (> 250 HCF) will receive rebates of 31-52%. 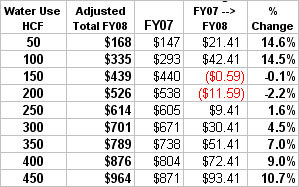 Below is a chart that compares FY07 charges vs. FY08 (adjusted) charges. It is interesting to note that low volume users (less than 100 HCF) had ~ 15% increase from FY07 to FY08 while high volume users (>250 HCF) had smaller increases (2-11%). 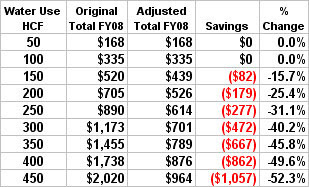 Mid-range water users (150-200 HCF) actually had a slight decrease in water/ sewer bills. If interested there is a copy of the full spreadsheet used for this analysis posted on LongmeadowBiz.com. Don't forget to vote in our poll about water rebates (--> top right hand corner)!